Heffron will be world champ! Fellow super middleweight Mark Heffron is destined to become a world champion according to Clitheroe boxer Luke Blackledge. 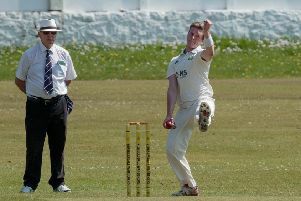 The 23-year-old from Oldham has been taken under the wing of Blackledge’s former coach Kevin Maree at his Gisburn-based hub after a hand injury blighted his progress. But the British number six, under the management of Gary Hyde, returned from an 18-month lay-off to floor Janos Olah in the first round at Hotel Holyday World in Benalmadena, Spain, at the weekend, breaking the Hungarian’s jaw in the process. Heffron, who was Amir Khan’s sparring partner five years ago in America at the famous Wildcard gym with Freddie Roach, has now won all 10 contests, with eight of those coming inside the scheduled distance, including his win over former Pendle professional Chris O’Brien in 2010. “I went out to Marbella with him as part of his team alongside Kev Maree and Gary Hyde. It was good,” said Commonwealth champion Blackledge. “Mark has improved a lot under Kev and he’s got a lot of talent. He hits like a heavyweight. I think he’ll become one of those fighters who people want to avoid in the UK. Heffron, who lost just six fights from 75 as an amateur, sparred with Blackledge ahead of his defeat to Rocky Fielding in Manchester in November, 2013. And Alex Matvienko’s supremo feels Heffron proved a more powerful opponent than four-time 168lb world champion Carl Froch, who also shared a ring with Blackledge in the build up. “I’ve sparred with him and he’s one of the hardest hitters I’ve ever gone up against,” he said. “I wouldn’t want to spar him again in a rush. I sparred with him at the same time I was sparring with Carl Froch and Mark could hit a lot harder than him. “He’s most definitely a future world champion. He’s just got to stay focussed and dedicated and work hard in the gym. Kev will look after him.